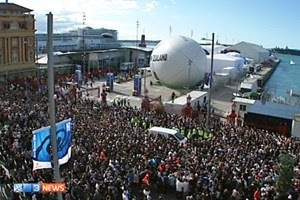 When the Rugby World Cup came to Auckland, this was the sort of place Queens Wharf became for a month or so. Pedestrian heaven. A place to meet people. It was a taste of things to come. But what sort of a place is it becoming? This posting looks at how transport decisions are shaping the place that is Queens Wharf. Some changes are for the good, but others threaten the potential for Queens Wharf to become a great place to go. In 1990, downtown Auckland accorded priority in its transport planning to general traffic. This is what the red lines illustrate. Boy racers made Queens Street hell on a Friday night, heavy traffic ran through the streets getting from A to B. 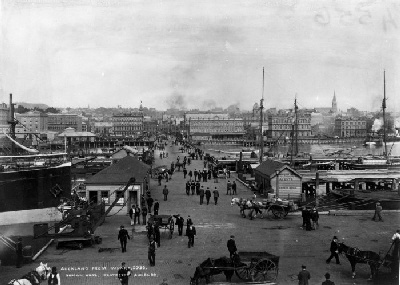 Ports of Auckland owned and operated Queens Wharf, and any related traffic movements were as shown, on the other side of the red fence. There were some bus routes into the heart of the CBD, but it was before the Northern Busway, and it was when buses had their station at the old Britomart - which is to the right of this map. Queens Street had good footpaths, for pedestrians, but Queens Street was not a pleasant walking environment because of the priority given the general traffic. A lot changed around 2002. Rail came into the CBD at Britomart. General traffic was excluded for Queen Elizabeth Square which became a major bus interchange, with better pedestrian amenity than my map suggests (forgive me). Buses came and went along Customs Street, and into and out of Queen Elizabeth Square. More bus services were provided along Queens Street. And the pedestrian environment along the seaside of Quay Street was widened and significantly improved. In 2010, Ports of Auckland Ltd sold Queens Wharf to Auckland Regional Council and Central Government. POAL stopped using it, and it was opened periodically for public access. The map records the fact that general traffic on Queens Wharf stopped. 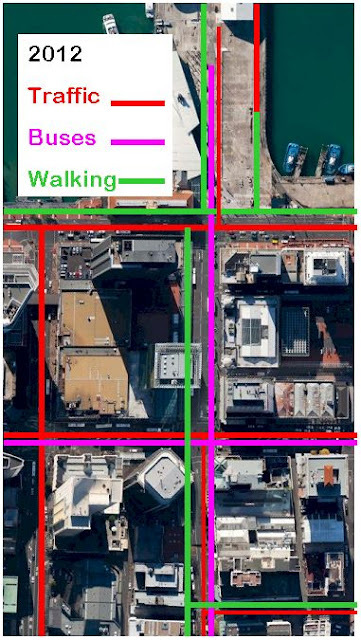 This map shows the improved pedestrian environment that had been provided earlier in Queen Elizabeth Square. It also records the dramatic improvement in pedestrian amenity along Queens Street. The narrowing red line along Queens Street reflects the fact that the changed priorities in favour of buses and pedestrians led to a significant drop in general traffic using Queens Street. The green line at the bottom of the map records the development of the very popular "shared space" roading in that narrow street area of the CBD. Then in 2011 Auckland hosted the Rugby World Cup. You will recall that Queens Wharf was opened up for pedestrian access in a big way. Much in the way of pedestrian amenity was provided (seating, toilets, big screen TVs, eateries, shelter), and it was very popular. Lots to do. People-watching. Also, and we must not forget this, a large section of Quay Street was completely pedestrianised for long periods. No general traffic, or buses were allowed in Quay Street. This was a significant moment, and one which was hugely appreciated and enjoyed by visitors to Auckland's downtown waterfront. This map records the main changes. It began slowly at first. 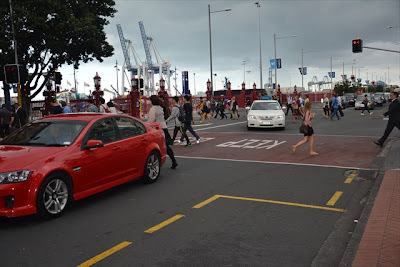 General traffic and some buses were allowed onto Queens Wharf using the red fence gate nearest the ferry terminal. At the time I recorded the danger this posed to pedestrians and ferry users in this posting. Another change was that part of the wharf (by Shed 10) has been permanently fenced off, and is used by traffic serving visiting cruise ships. These changes have slowly and gradually been bedded in this year. But there is still time for sanity and longer term planning to prevail - especially if the goal is place making on Queens Wharf. The most damaging change has been the establishment of a traffic light controlled intersection directly off Queens Wharf, onto Quay Street, right next to the ferry terminal, directly across from Queen Elizabeth Square, and slap bang in the middle of an area of very high pedestrian movement. The street end of Queens Wharf is being turned into a road for general traffic, taxis and buses. This road is adjacent to the Ferry terminal, and severs it from the informal public areas and activities that are being trialled on Queens Wharf. Ironically, changes to passenger handling inside the ferry terminal now mean that the wall of the terminal that faces the wharf could be opened up and activated. (You can see better what I mean with this. Look at this posting in which I use a simple model to roughly illustrate the ferry terminal building edge which can now be activated without affecting ferry services. This is what happens on Quay Street every couple of minutes. It's full of pedestrians crossing from Queen Elizabeth Square to the Ferry Terminals and the promenade side of Quay Street. And back again. This photo doesn't do justice to the massive articulated trucks that pound this road. 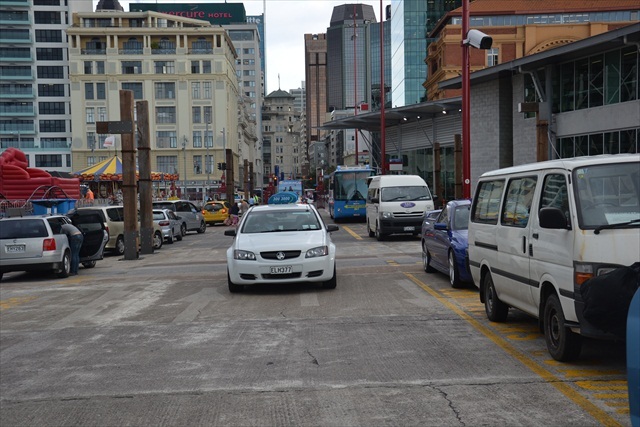 This is the road that is damaging Queens Wharf as a people place, as a place for pedestrian activity and fun. It has grown like topsy. It needs to be nipped in the bud. Because there are better ways of managing Queens Wharf's general traffic and bus transport needs. If Auckland's goal is to be the most liveable city, then it needs to increase (not decrease) pedestrian priorities in the transport planning for Queens Wharf and its surrounding street network including Quay Street. I accept that there will be a need for traffic movements on Queens Wharf. But these could easily follow the route taken by Ports of Auckland, and entry and exit can be via the POAL's entry further East along Quay Street. As shown here. 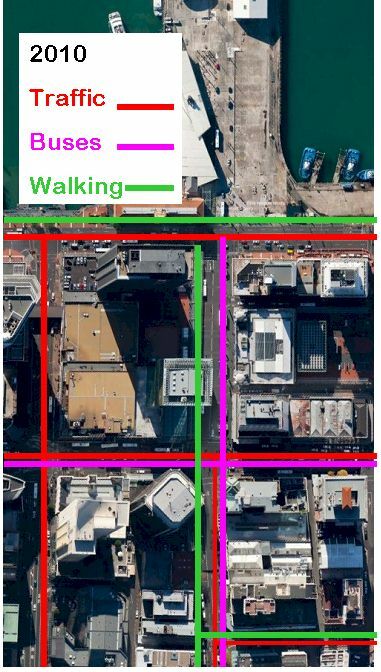 Quay Street needs to be developed as Auckland's CBD waterfront promenade. If necessary buses and taxis can pick up and drop off at the ferry terminal on Quay Street. Queens Street needs to be further pedestrianised. And Customs Street is the ideal route for a high frequency and high quality tram service connecting the central city with Wynyard Quarter, and servicing Queens Street itself. 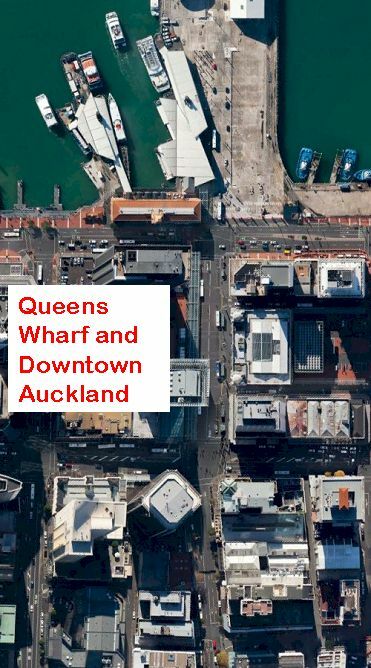 This needs Auckland Council, Auckland Transport and Waterfront Auckland to work together and deliver good place-making and transport planning on and around Queens Wharf. Mangawhai: Fixing Faults or Validating Mistakes? As the Mangawhai rate strike against Kaipara District Council’s mismanaged sewage scheme approaches its first anniversary, and the argument moves through the High Court and into Parliament for resolution, the fundamental role of the banks begins to loom large, requiring intervention. The Mangawhai Ratepayer and Residents Association has been working hard toward a High Court judgment that Council acted unlawfully – particularly when taking on substantial bank loans. Last week the Association wrote to the Minister of Local Government seeking a meeting before filing its Statement of Claim for judicial review proceedings. Meanwhile the Kaipara District Council (KDC) government appointed commissioners have been working behind the scenes on an approach known as validating legislation, and this was made public last week. As part of that announcement Kaipara District Council finally acknowledged that a number of “irregularities” occurred in the setting and assessing of rates in each of the financial years 2006 to 2012. It also conceded that it failed to meet Local Government Act (LGA) consultation requirements for its most recent long-term plan 2012-2022. These admissions (more than fifty are listed) are good news to ratepayers because their doubts about the Council have been confirmed. Council’s admissions of irregularities, failures and breaches of the law have rendered aspects of ratepayers’ planned legal action unneccessary. But the next question is what to do about these admissions. For example it means that the Council is, by its own admission, now operating outside the law because it has no valid Long Term Plan. To deal with this gap, KDC’s commissioners have released draft “validating” legislation which is intended to restrospectively fix all irregularities and failures. This Local Bill is to be introduced into Parliament at the earliest opportunity. Commissioners will be hoping for a quick passage, but residents are increasingly concerned that it will just lock in their problems and concerns, rather than solving them. This is draconian stuff. It sets a dangerous precedent, not just in Local Government but for the future of democracy. It suggests that when a council oversteps the mark and ignores the community and breaks the law, then government will step in and validate that behaviour. A further problem with the broad validating approach is that it ignores individual ratepayer differences and the different impacts the “irregularities” and “failures” have had. A one size fits all Bill risks angering and upseting members of the community. They will be forced to make submissions to the Select Committee who probably won’t be able to take a blind bit of notice. A cynic might suggest that’s all part of the Government’s bigger plan to amalgamate councils up and down the country. More than one MP has called for the Far North District Council, Kaipara, Whangarei, and Northland Regional Council to be merged. Sowing anti-council dissent among Kaipara ratepayers might assist that objective. That would be a negative outcome. These areas need effective local government, not the massive costs and distant administration of another super council. Local Government exists for one reason. It is there to administer, provide and fund the different needs of different locals in a local environment. The uniform validating legislation being pushed through now by commissioners is a whitewash which might fix the council, but won’t address local issues. But probably the most profound issue all this raises is the role of the banks and the size and impact of the bank debt. Mangawhai ratepayers believe that most, if not all, of these KDC borrowings were not lawful. The rate strike has been strongly supported because of resistance to paying interest on loans ratepayers had little or no say over. Kaipara District Council borrowed money from Amro Bank to begin with. Later, Amro Bank sold those loans to the Royal Bank of Scotland (RBS), which, during the global financial crisis, almost went bust and needed to be bailed out by the UK Government. Prior to the bailout and to increase its liquidity the RBS embarked on a fire sale of various assets and loans – including the Kaipara District Council loans. These were purchased by ANZ and BNZ. You can be sure they would not have been purchased at face value. I am advised the purchase price for those loans would be less than 50 cents in the dollar. Yet both banks are presumably charging Kaipara District Council – and ratepayers – the interest rate agreed with Amro. Given the disagreement over the loans and the traded nature of the borrowings, what might be a fair rate of interest from now on? How does it all work? Events when Councillors were sacked and Commissioners appointed illustrate the nature of the relationship between the banks and KDC. To prepare the ground for the change in governance reassurance was sought from the banks that they would not foreclose on the loans (retirement of a Council is a breach of the covenant between bank and council). The banks, for their part, needed to be re-assured that the Council would be a “going concern”. This reassurance indicated that it would be able to fund the interest on the loans from rates revenue. It is deeply ironic that this reassurance was given September last year, in the light of commissioners’ admissions now that Council has been operating outside the law with no valid long term plan. This means that since September it has had no power to operate as a local authority in New Zealand, or collect rates, or to claim it was a going concern. Tellingly, at a public meeting on 11 February, Commissioner Chair Mr Robertson stated that KDC only pay 10% of their interest charges using money raised from rates. The rest they pay by capitalising the interest and borrowing more. The rates burden that will fall on the district if they move, as they say they will, to pay-as-you-go, will be likely to double local residential rates to around $5,000/household. Tread carefully. Don’t rush into validation of bad decisions. Building trust between ratepayers and Council will require careful local solutions, negotiated over time. Kaipara District Council has been sacked. Commissioners appointed to fix the mess. And their latest initiative - validating legislation is in the public domain. This is a Local Bill. No public discussion or consultation occurred. The Kaipara District Council acknowledges that a number of irregularities occurred in the setting and assessing of rates in the financial years relating to 2006/2007 to 2011/2012 (inclusive). This has raised questions about the validity of those rates.... Some of the rates in question relate to the capital and operational funding of the Mangawhai EcoCare Wastewater Treatment Scheme....The Council considers that it is desirable to address the rating irregularities and legislation is the only means by which the rates can be validated and any penalties payable on any outstanding rates can be validated. You can read the Bill for yourself. It can be downloaded here. In fact it is an incredibly interesting read because it carefully lists many of the mistakes the council made over the last 6 or 7 years. If you want to make a submission then it helps to read it. The timeline for submissions isn't known yet. 15 Validation of rates assessments Despite the failure of the Council to set out some of the information required by section 45(1) of the Rating Act, the Council's rates assessments for the 2006/2007, the 2007/2008, the 2008/2009, the 2009/2010, the 2010/2011, the 2011/12, and the 2012/2013 financial years are valid and declared to be and to always have been lawful. This is tough to take. It's like saying, these rates assessments were lies, but we'll make them true with this law. Commissioner Chairman Robertson has said, that this is a one-off situation that has to be addressed and there is no other way. But the government has done absolutely nothing to improve the supervision of councils and its recent changes to Local Government law remove most of the requirements on councils to consider the well-being of their communities when they do things. So all of the councils up and down the country who are ignoring the law as it stands now know they can carry on ignoring the law, because if Kaipara can get away with it on this scale, so will everyone else. This Bill sets a terrible precedent, not just in Local Government, but for the future of democracy.